Zoology alumni rate undergraduate research as one of the top academic experiences they had at UW. The Department of Integrative Biology endorses undergraduate research as one of the most potentially rewarding aspects of the undergraduate experience. Each research project is based on an individual agreement between you and a research mentor. Your research mentor will help you define a research problem, design experiments, and interpret results. Students often work closely with a graduate student, post-doctoral associate, or other member of the lab. You will be expected to work in a team, to adapt to a specific research topic, and to meet deadlines. UW expects students to put in an average of 45 hours (3hrs/week) to receive one research credit. Students can take 1-6 credits of research each semester, but the typical enrollment is 2-3 credits. Given the amount of training time required to bring you up to speed in the lab, many research mentors look for students who are willing to participate in another semester in their lab. Faculty campus-wide may sponsor you for undergraduate research. To narrow your search, think about which areas of biology you would be most excited to learn about. Reading journals, science news, and talking to your professors and TA’s can help you define your interests. Keep in mind that some faculty may not be able to take a student for whatever reason. Be prepared to repeat the process a few times-tailoring your email slightly for each individual you contact. Before you meet with a potential mentor, be somewhat knowledgeable about her or his work. You can often find abstracts, or publication lists on the researcher’s website. This will help to make your interaction more positive and productive. Your potential mentor will want to find out more about you before they commit to working with you in the lab. They may ask about your interests, motivations, preparation, and expectations. This is your opportunity to do the same. Ask questions about the projects currently going on, possibilities where you could fit in, who would supervise your work, whether he/she has had undergraduates working in their lab before, and anything else you’re curious about. If it seems like a good match, ask if they would agree to be your mentor for one of the projects! If a faculty mentor accepts you as an undergraduate researcher in their lab, you will need to enroll in a Directed Study (or Thesis, if applicable). To enroll in a Directed Study/Thesis (Zoology 199, 299, 681, 682, 691, 692, 698, or 699), you must fill out a course authorization form and have your faculty mentor sign it. Once signed, turn the form into 152 or 244 Birge Hall and a department advisor will grant you permission to enroll. You must enroll through your Student Center using the section number of the course that will be provided to you via email. To gain a better perspective on what it is like to conduct research at UW, please see the following sampling of exciting research projects involving both current and past zoology students. 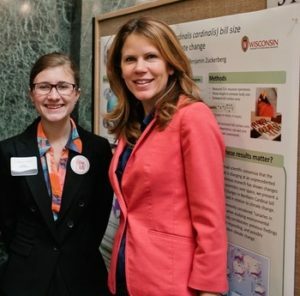 Colleen shares her research with WI State Rep. Chris Taylor at Posters in the Rotunda. How did you initially get involved in research? I first became interested in joining a lab my freshman year at UW. Following the advice of older students and my advisor, I emailed several professors whose work I found interesting. These faculty members were principle investigators that did work in a range of subjects. I decided to meet with two different professors, one of whom was Dr. Anthony Ives and his postdoctoral student Dr. Brandon Barton. After going through the interview process multiple times, I decided that I would work with Dr. Ives beginning the following summer. What research did you participate in prior to your thesis research? Prior to my thesis research, I participated in two separate projects in the Ives Lab. I initially worked at the Arlington Agricultural Research Station collecting population metrics of the insect community in soy, corn and alfalfa fields. This experience continued into the following summer during which I undertook my own project in collaboration with Dr. Barton studying the effects of light pollution and night warming on aphids and their predators. Fortunately, this experiment was successful and has resulted in an in-progress manuscript. The summer after my junior year I decided to do a REU internship with Dr. Ives at his LTREB site at Mỳvatn, Iceland. During this summer I conducted routine sampling studying the population dynamics of the midge populations as well as my own project. I undertook an exploratory project to document the presence and possible influence of parasites on the midge population, which was previously unstudied. The success of this project led to further research and documentation of parasitism and its effects on population dynamics, which will continue on that site. 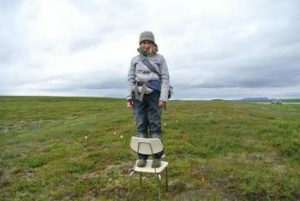 Assisting with research on the ecological effects of fertilizers in Myvatn, Iceland. In addition, I completed an internship in Dr. David Lovelace’s lab the fall of my junior year at the Geology Museum preparing Triassic fossils he had collected. I also completed a small research project during my study abroad experience through the Ceiba Foundation with Dr. Joe Meisel. I had a very strong research basis through the Biocore program, which emphasizes an understanding of research methodology, which was formational for my research experiences. What led you to your thesis project, and which research questions did you seek to answer? Since I had declared honors in the zoology major, I was required to complete an honors senior thesis. I connected with Dr. Benjamin Zuckerberg through his Climate Change Ecology class (Zoo 660). I decided to begin volunteering in Dr. Zuckerberg’s lab that winter under the mentorship of his graduate student, Mr. Christopher Latimer. 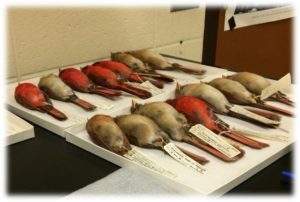 Northern Cardinal specimens that Colleen studied at the UW Zoological Museum. Which research methodologies did you use to answer these questions? In order to answer this final question, I measured approximately 600 Northern Cardinals from museums all over the United States. I focused on measurements of the bill and tarsus of the birds, but I took eight measurements of each bird three times total. This process took several months along with a good deal of collaboration with curators, collection managers and other museum personnel. After the measurements were completed, I then needed to learn how to code and conduct simple statistics in R Software (Stat 327 is an introduction to R). I then analyzed my measured data against climate data from the past century in R.
We found correlations between temperature changes over geographical and temporal gradients and bill size of Northern Cardinals. These exciting results and their connected data will lead to further exciting research in the fields of climate change ecology and morphology. Colleen would like to acknowledge the generous support of Laura Monahan, Paula Holahan, and Emily Lannoye at the UW Zoological Museum.